A person with short-sightedness can see close objects clearly, but may have trouble seeing objects from a distance – like a road sign, blackboard, or face across the room. It’s a common condition, affecting 1 in 4 adults worldwide. 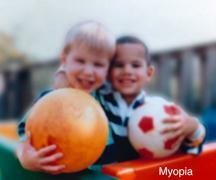 Short-sightedness or myopia happens when the eye has a long shape, which causes light rays to focus too far in front of the retina, making distance vision difficult. 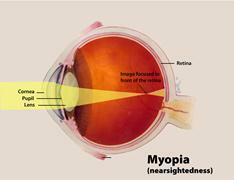 Like Long-sightedness, myopia can be inherited. It is often discovered when children are 8 to 12 years old. During the teenage years, when the body is growing rapidly, it can get worse. Typically, between ages 20 and 40 there is little change.